1. What is The Wire? 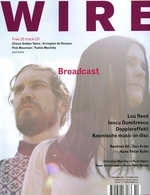 The Wire is an independent, monthly music magazine covering a wide range of alternative, underground and non-mainstream musics. The Wire celebrates and interrogates the most visionary and inspiring, subversive and radical, marginalised and undervalued musicians on the planet, past and present, in the realms of avant rock, electronica, hiphop, new jazz, modern composition, traditional musics and beyond. Passionate, intelligent and provocative, The Wire wages war on the mundane and the mediocre. Its office is based in London, but it serves an international readership. 2. How old is The Wire? The magazine was founded in 1982, primarily as a jazz and New Music magazine, with a brief to "unravel the mysteries of music and musicians for those who look for fundamental answers about the nature of music...". Between 1984-2000 it was owned by Naim Attallah's Namara Group. In December 2000 it was purchased in a management buy-out organised by the magazine's staff and has been run independently ever since. 3. Who is The Wire? The magazine is run by a small, dedicated team of full-time staff, plus a large international roster of over 60 freelance writers, stationed at points across the globe. Acclaimed music critics and experts amongst our contributors include Kodwo Eshun, Biba Kopf, Ian Penman, Simon Reynolds, Mark Sinker and David Toop. 'Star' contributors have also included Brian Eno, Lee Ranaldo (Sonic Youth), Julian Cope, Greil Marcus, Robert Fripp, Jon Hassell, Robin Rimbaud, Paul Schütze and Howard Skempton. 4. What's The Wire's agenda? There's no written constitution and no hardened music policy for inclusion or exclusion. The Wire seeks out the best current musics in, and between, all genres; and is committed to investigating music's past as well as its present and future. We are a 100 per cent independent operation, owned outright by the staff. There is no pressure from a publishing house to compromise our content, and we are at liberty to decide everything that's printed in our magazine - we won't let advertisers, record companies or press agents set the agenda.